Every Thursday, Spacing will bring you a snapshot of Toronto’s past, looking into what took place that day in the city’s history. Throwback Thursday will address how the city has evolved, with an emphasis on issues that remain relevant for development in Toronto today. Almost one hundred years ago today, the City’s Trillium Ferry began carrying hoards of Island-bound Torontonians across Toronto Bay, much like it still does today. 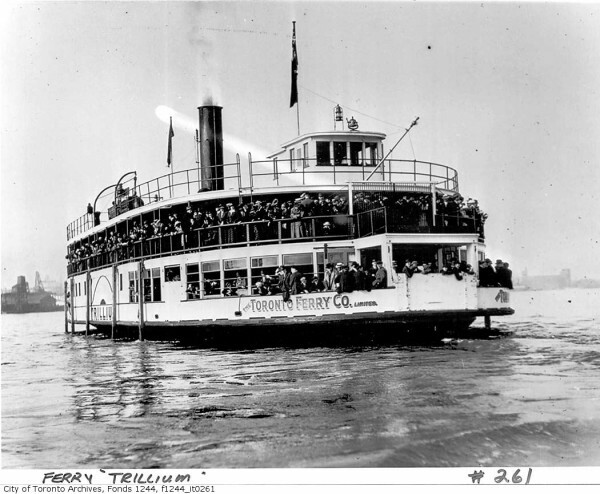 Launched into the harbour in 1910, the Trillium was initially built for those hot summer days when the crowds would overwhelm the three other “flower ferries” – the Primrose, the Mayflower and the Bluebell. Built by Polson Iron Works Limited, the $75,000 Trillium was an exact replica of her sister ship, the Bluebell, built four years earlier. The largest of the four “flower ferries,” the Trillium was named the flower of Ontario and had an original passenger capacity of 1450. Like today, the Trillium is still used to transport people to the Island on especially busy days where her large passenger capacity helps to ease wait times. Yet unlike now, in 1910 these busy days coincided with Maple Leafs baseball games, which were played in their newly built ballpark on Hanlan’s Point. First operated by Lawrence Solman, who also happened to be the owner of the Maple Leafs Baseball team, the Trillium was built to help meet the needs of a growing number of Toronto baseball fans. Solman, as owner of both the Trillium and the Baseball team, made money from both the baseball tickets and the mandatory ferry trips to and from the Island ballpark, which he charged separately. Solman’s moneymaking scheme soon grabbed the attention of City Hall, who decided to take control of the Toronto Ferries by forcing Solman to sell his ferry fleet to the City. When Solman got wind of the City’s plan to confiscate his ferry fleet and put them under the management of the Toronto Transportation Commission, he decided to build a $750,000 stadium seating 20,000 people on the mainland. So when the TTC finally took over operation of the fleet of Harbour ferries in 1927 (meaning a streetcar transfer could get you onto the ferry for no extra charge) Solman’s new Maple Leaf Stadium was already a year old, sitting at the corner of Bathurst Street and Fleet Street. Because of the ballpark’s relocation, the demand for ferry service to the Island took a severe hit. More problematic, however, was the terrible shape of the ships handed over to the city by Solman; the Trillium suffered from extensive dry-rot to its upper decks, which often held as many as a thousand passengers. Despite her condition, the Trillium was repaired and put into active service for 25 years until she was replaced by several faster diesel-powered ships in 1952 and finally retired from use in 1957. For 19 years the ship would lie abandoned in an Island lagoon, gradually falling into complete disrepair. In 1974, interest began to build as to whether the Trillium would ever be used again, specifically as a floating restaurant or a museum. Tommy Thompson, the Commissioner of Metro Toronto Parks that had taken over ownership of the ferries from the TTC in 1961, instead ordered a $1 million retrofit for the existing four ferries, including the Trillium. By 1976, the Trillium had been completely restored to its 1910 appearance, including the original engine and side paddle-wheels. A special dock was built on the eastern side of Queen’s Quay to accommodate her wide girth and her passenger capacity was reduced to 955 people. Worthy of note is the Trillium‘s collision with the S.S. Normac in 1981. Built in 1902, the Normac had the original floating restaurant that is now Captain John’s Harbour Boat Restaurant. The Normac sunk (photo here) two weeks after hitting the Trillium, leading the restaurant to relocate to the M.S. Jadran, which houses many of the salvaged ruins of the Normac, including the old wooden wheel. 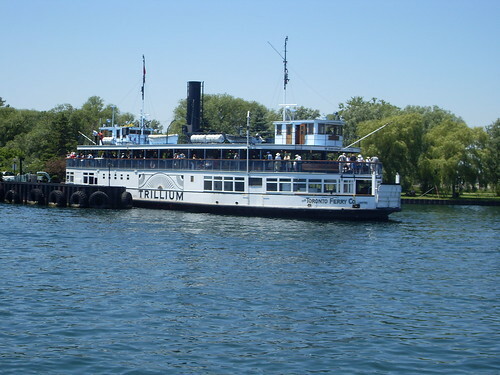 The Trillium continues to operate in the Toronto harbour on particularly busy summer weekends, especially when there are festivals on the Island. Unlike the other more modern ferries, however, the Trillium can take almost an hour to cross the harbour, giving the curious passenger plenty of time to check out the paddle-wheels in motion as well as the small displays usually set up on the lower deck. For more information on the Trillium, see Mike Filey’s book Trillium and Toronto Island. It looks like a lot more people visited the islands back then. Weekends on the Island are jam packed — long lines for ferries, etc. Sometimes ferry so packed, we must wait for the next one. The Trillium is something that says “Toronto” to me. Does anyone know what the passenger capacities are of the more modern ferries? People had a lot more reason to go down to the waterfront before they invented air conditioning. just how big are you to have such difficulty fitting under the Gardiner? As far as the amount of people, it reminds me of the old Sunny Side Pavilion pictures. Well, the docks were closer (i.e. no landfill yet). But otherwise, it was arguably worse than better, because you had to negotiate the kind of wide and dangerous multitrack level crossing that’d make the one at Strachan blush. Next to that, the Gardiner/Lakeshore’s nothing. In the 1940s it was easy to get to the Islands from East York. Walk to the Danforth streetcar. Transfer to the Yonge streetcar – I don’t recall if there was a Bay streetcar. Get off right at the ferry dock and board the ferry of choice – usually to Centre Island, the busiest place or Hanlan’s Point where an amusement park was located. And, best of all, the ferry fare was a single ‘streetcar’ ticket. Actually in the 1940s you wouldn’t have taken the Yonge streetcar. It only went as far as Front, just as the Yonge subway does today. You would have taken the Bay streetcar. If fact you can still take the Bay bus to the Ferry Docks, except that it doesn’t ramp up service during the summer like it did back then. The Harbourfront streetcar is now the main service to the Farry Docks and it does ramp up service during the summer. I was a Centre Island summer resident for the first 4 years of my life. That was during the war. My grandparents had a house that was separated into self-catering rooms. It was on the Lakeshore between Manitou and Clandeboye. My dad used to commute daily up to Ontario Hydro at University and College. I remember watching him ride his bike to the ferry docks in the morning. The island ferry terminal had a huge bike shed. In 1943 the water on the island was quite high. Outside the house we had to walk around on raised wooden tracks which covered the concrete paths. No tricycle riding that summer! High water summers like that one eventually led to the demise of the Island community, the razing of the houses, and the raising of the water table. The island was a place to put the fill from the subway.